Sunderland Software City have joined forces with Gateshead Council and PROTO: The Emerging Technology Centre, to bring Go Reboot to Gateshead residents. 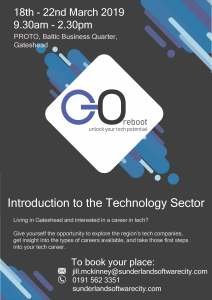 Showcasing some the regions most advanced and exciting tech businesses, the Go Reboot Expo offers a great opportunity for local people to come along and meet some of the incredible businesses working in the region. You’ll discover more about the businesses and what it is that they do, find out what skills and experience these growing businesses are looking for as well as hear about training and job opportunities. If you are local to Gateshead, you are invited to join us to celebrate the fantastic work of local business and to discover how you can be part of it! The Expo will take place on site at PROTO (location details can be found here) and will run from 1pm until 5pm. You are welcome to come along at any time that suits you.